La Gazzetta del Mezzogiorno Italian newspaper’s feature, mentioning about Italian composer, Massimo De Lillo’s participation in EBM’s “Christmas Concert 2018” and also introducing EBM. Published on Wednesday 2nd January 2019. 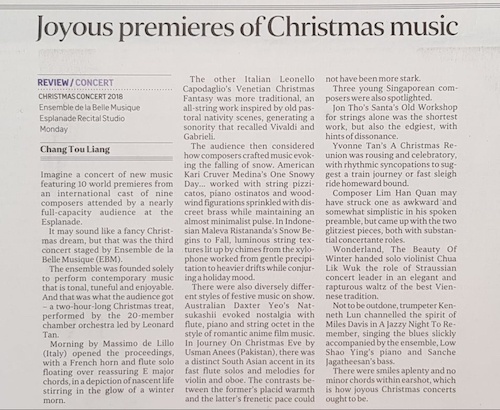 The Straits Times review of EBM’s “Christmas Concert 2018”, published on Wednesday 19th December 2018. Quotidiano di Bari Italian newspaper’s “Culture & Shows” section, introducing EBM and its “Christmas Concert 2018” concert. Published on Tuesday 9th October 2018. Lianhe Zaobao Chinese newspaper article introducing EBM and its “Love & Longing” concert. Published on Tuesday 5th June 2018. 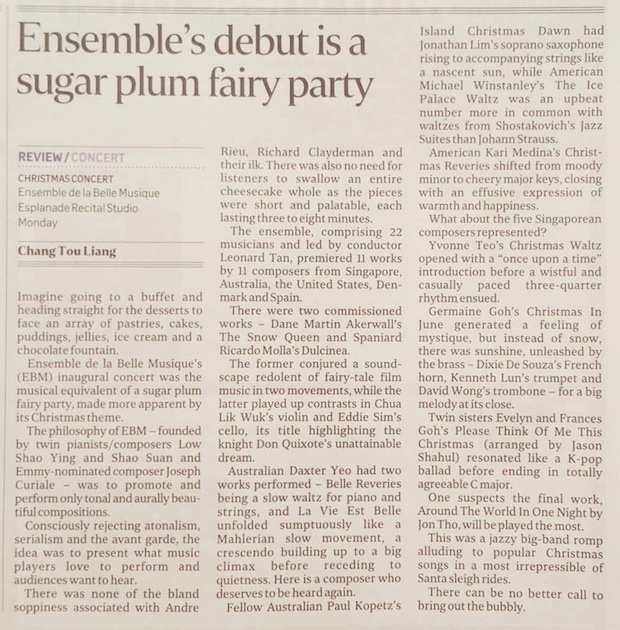 The Straits Times review of EBM’s inaugural concert, published on Wednesday 20th December 2017.